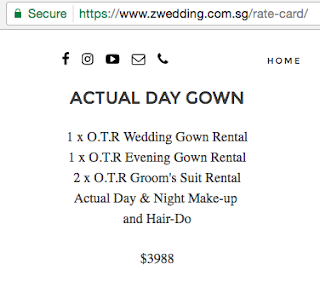 SG Budget Babe: Should I get a bridal package or go ala-carte? Should I get a bridal package or go ala-carte? Between convenience and quality, which do you value more? If you answered convenience, then bridal packages may be easier for you as they can offer a great deal of convenience to brides who are too busy to take care of the nitty gritty details. This can include your pre-wedding shoot, printed albums, makeup and hairstyling, corsages and bridal bouquet, your gowns and suits, actual day photographer and videographer, etc. They can all come included as a single package for your convenience without you having to source from multiple vendors. Of course, the trade-off is that the price you thus pay for bridal packages is a lot higher, sometimes two-fold of what it would cost if you DIY-ed the different vendors yourself. Also, you won't be able to choose the quality that you want in terms of the other vendors. In other words, if you've always dreamt of using certain photographers or videographers for your wedding to capture a certain look, you'll have to give up on this desire if you go with a package where you're limited to the vendors they work with. When we visited BOWS and a few bridal studios to examine their PG works, they didn't quite have what we were looking for. Another point to note is that as with most package deals, you run the risk that your bridal salon might just shut down. Just look at couples left stranded when Sophia Wedding Collection (which had been in business for over 10 years) abruptly shut down - some couples lost up to $8000 on the bridal packages that they had signed up for and paid in advance. No pre-wedding night shoot or overtime pay for the photographer. If you exceed, prepare to pay extra. No fresh flowers for pre-wedding shoot. Top up if you want this option. No transport included for wedding shoot. Please pay for photographer's transport. Makeup artist will not tag along for your photoshoot. Please pay extra if you want them to be on standby. Printing of album may require extra costs. Your package includes gowns but you're only given a limited range to choose from. If the gown you like is from their "designer" or "premium" range, you'll be asked to top up per gown. How many wedding gowns are you provided with on the pre-wedding photoshoot and actual day? Is dry-cleaning of gowns included in the fees? Some bridal shops have gowns that they allow only for indoor shoot. You might be asked to top up for dry-cleaning costs if you want to use it for outdoor shots. Extra charges for rental of accessories. No Ampoules and false eye lashes included in your package. You might be asked to top up $50 - $100++ for these items, and the makeup artist will often not allow you to bring or provide your own. What a joke! If you need your makeup artist to come early, there's often early morning surcharge before 8am. This is quite ridiculous as well as most brides typically need to start their makeup between 4am - 6am at the latest, due to traditional customs calling for the gatecrash to be held early in the morning at an auspicious timing for the groom to pick up the bride. Trial makeup might not be included, and you may be asked to top up for this. Will you be given an artificial flower bouquet? Some studios may ask you to top up for fresh flowers. Check if corsages for your bridesmaids, groomsmen and parents will be included. Often, this may require additional top-ups. Depending on who you go for, prices can either be really affordable, or sky-high if you pick the more "premium" photographers / videographers / makeup artists. When it comes to photography, videography and makeup artists, there's really no substitute for true artistic talent. Some PGs / VGs are more skilled in capturing raw moments, many frame their shots differently, some process their photos/videos with a different colouring or tone, etc. 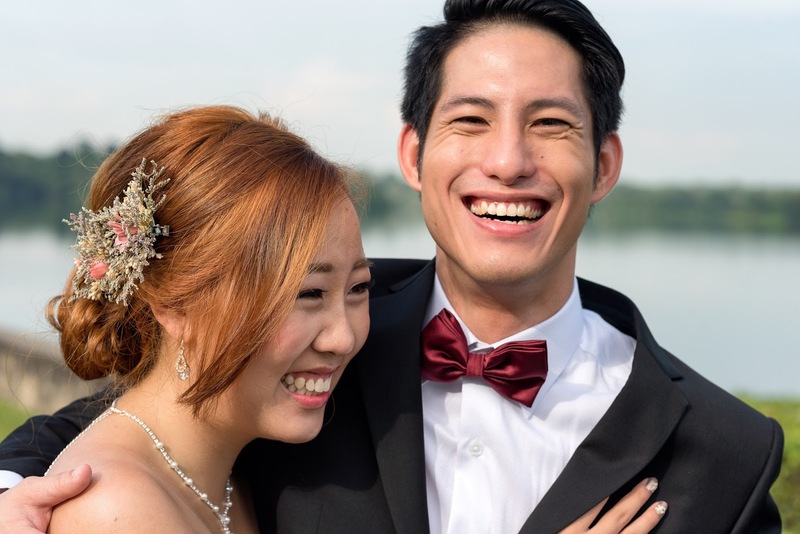 For instance, we chose Cepheus Chan Photography because we liked his bright and vibrant colours, which results in photos that capture the essence of "happiness" in an instant. My pre-wedding photo by Cepheus Chan Photography. Makeup by Team Bride SG. For makeup artists, there are those who are more skilled in Korean styles vs. Taiwanese makeup. Some have magic fingers in contouring and covering facial blemishes, whereas others prefer to create a more natural but radiant look. Among the ones I enquired with, there was a makeup artist who charged an exorbitant $1000 for her work! If you go with a bridal package, you're limited to their makeup artists; they might be good, but not necessarily skilled in the style or look you're hoping for. Note that PG and VG are only for EITHER pre-wedding OR actual day. If you want both, use double of the price as an estimate, although most PGs and VGs offer a package discount if you opt to use them for both. There may also be promo prices run at any point in time as well. Thus, if you prefer a certain PG / VG / MUA's style, then going ala-carte would be a better option. You can opt for just rental of gowns from a bridal studio, but depending on which one you pick, you may or may not be saving much in terms of money paid. Remember that you'll have to factor in the gown rental costs for both your pre-wedding photography and actual wedding day. Some bridal studios charge $1500 per gown rented, whereas Z Weddings had a package for almost $4000 for just outfit and HMUA services on your big day. That.is.not.cheap.in.my.books, nor is it affordable for the average budget bride at all! Should you get the gowns from Taobao then? Or would it be better to rent locally so that you can ensure the gown fits well? Stay tuned for my next post to read about my experience before you decide - I tried both!